Arbroath FC Golf Day – Friday 7th June – SOLD OUT! Thank you so much to everyone who has signed up! We look forward to seeing you on the 7th June! 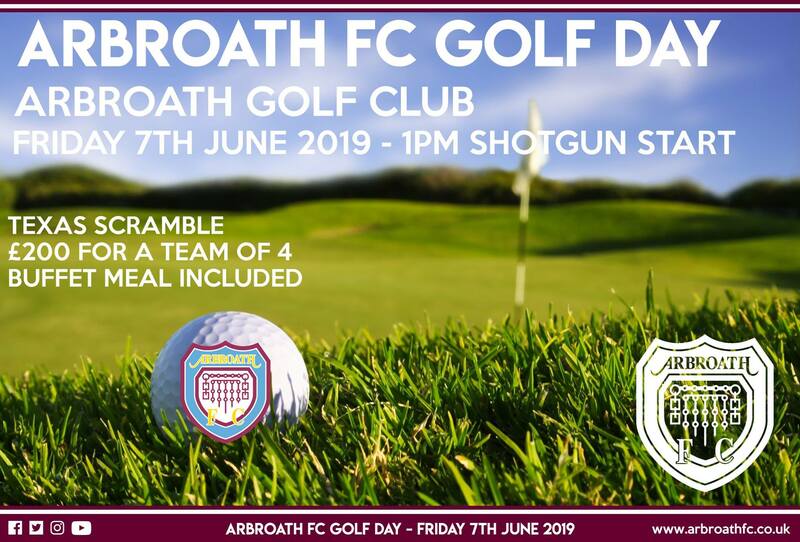 Arbroath FC are delighted to announce that we will hold our annual Golf Day on Friday 7th June 2019 with a 1pm Shotgun start at Arbroath Golf Club. The cost will be £200 per team for Teams of 4 people which includes a Buffet meal and the competition will be played as a Texas Scramble. This is sure to be a great day out for all golfers and supporters of Arbroath FC, but even those who play the occasional round this could be for you! Texas Scramble is a team competition. In the purest, simplest form of Texas Scramble all members of the team tee off. Then one of these drives is chosen to be used for the next shot and all members of the team place their balls where the chosen drive ended up, and all the team play a second shot from this spot. From these second shots, one is chosen and all play a third shot from there – and so on until the ball is holed. Each team returns one score for each hole and the team with the lowest score for the round wins.